The Flip the Frog cartoon "The Soup Song" (1931), excerpted in "Futurama"
“Futurama” is a show that rewards diehard fans with all sorts of Easter eggs: little semi-hidden gags or references that only make sense if you know the show’s “universe” particularly well. (That's another reason why this show is still rewarding for me — I know it well enough by now that I understand some of the gags that were previously obscure to me.) Here’s a primer for the uninitiated, but I recommend just watching the show. One of the better-known such jokes occurs during the opening credits of the show, which takes place in “New New York” in the year 3000, when pneumatic tubes span the city and provide easy transportation to its residents. Watch carefully, and you’ll see most of the show’s recurring characters zip through these tubes; those characters vary in number and identity in certain episodes, and it’s part of the fun (for us fanboys, at least) to try to spot variations. 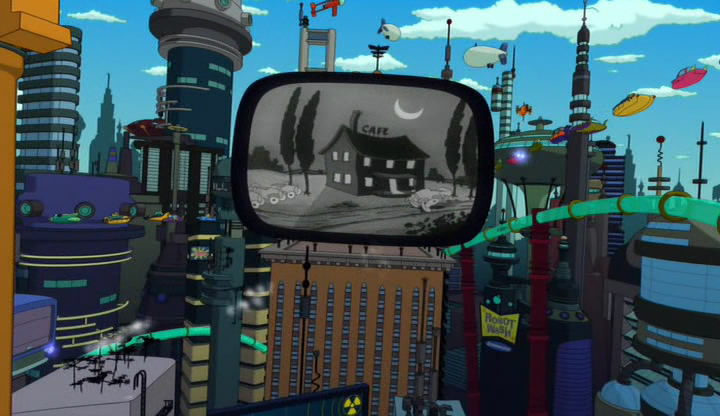 Another, even more fun fact about the “Futurama” opening credits is that, in many episodes, they conclude with a shot of the main characters’ spaceship crashing into a giant, television-like billboard, on which a vintage Hollywood cartoon is always playing. Moving images from these cartoons play for just a couple of seconds before the ship crashes into the screen, destroying it. Typically, the films excerpted in the show’s credits are Looney Tunes or Fleischer Studios products (e.g., Betty Boop, Koko the Clown) from the 1930s and 1940s, but a few oddball titles filter in every now and then: a snippet from a 1959 “Clutch Cargo” episode, the obscure 1949 Paramount cartoon “Toys Will Be Toys.” Even animation nerds who are well versed in cartoons of this era — and I count myself in that group — have a hard time identifying these films from the quick extracts that flash by. But, again, that’s part of the fun. Since this is the internet, someone has already taken the trouble of identifying — and including screenshots of — all the cartoons in “Futurama”’s opening credits. This is the kind of thing that makes me want to give the internet a big high-five. I think the site has a few errors, but they're outweighed by the fact that the list exists at all. This time around, I’ve found myself focusing on and thinking about the show’s inclusion of these cartoon snippets. They can’t be called gags, per se, because it’s not exactly funny, or even clever, simply to include a fragment of another film. Try as I might, I can’t detect any similarities, aesthetic or thematic, between the excerpted cartoons and the episodes of “Futurama” in which they appear. Perhaps connections exist, but I haven’t been able to pick up on them. And, though I haven’t researched this topic with any real thoroughness, I can’t seem to find out why, exactly, the show’s creators decided that this particular semi-joke was worth repeating so many times with variations. It’s not like any of these excerpts evokes big laughs; at best, they cause those who recognize the quoted films to feel a small sense of satisfaction for having good visual memories. The Looney Tunes film "A Corny Concerto" (1943) excerpted in "Futurama"
Then I started wondering how the show’s creators were able to excerpt these cartoons at all. Given that American copyright law is in a state of almost constant obscurity and clusterfuckery, multinational entertainment concerns such as 20th Century Fox — which produced “Futurama” under the jokey, diegetically appropriate name 30th Century Fox — employ modest-sized armies of intellectual property lawyers who are charged with interpreting such laws in the company’s favor. These cartoon excerpts got me thinking about how Fox didn’t find itself sued on a weekly basis by the copyright holders of the cartoons. In all likelihood, Fox simply paid licensing fees to the owners of these films’ copyrights. That would be a reasonable thing to do, especially for a big, for-profit company that wants to ensure that the shows it broadcasts are free and clear of any complicating legal issues. But it does make one wonder how the show’s creators convinced their network to spring for the sums necessary to secure the permission to use these films — since, as I say, the purpose of the quotations remains pretty obscure. Alternatively, could “Futurama”’s creators have claimed these excerpts are examples of "fair use"? In my completely uninformed legal opinion, probably not. And not because the clips' duration exceeds a certain percentage threshold — such a provision is not, despite rumor, part of the fair use doctrine. Rather, the claim of fair use in this context seems inappropriate because, so far as I can tell, the cartoon excerpts are not used for satirical or parodic purposes, or for educational or informational use. Nor are they included without intent. This leaves me with two questions. First, why were these brief excerpts included? If the answer to this question has to do with satire, parody or commentary, then the show’s creators could legitimately have claimed protection under fair use. Second, did they? Any “Futurama” scholars out there are invited to contribute to this discussion. In conclusion, allow me to say simply, ALL GLORY TO THE HYPNOTOAD.